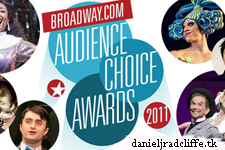 Just a quick post to let you all know, that Broadway.com has posted that Daniel will be one of the presenters at the Audience Choice Awards this year! (so this will be the second job for him to present this year?) which will be presented live at the Allen Room at Jazz at Lincoln Center on this Sunday, 15th May. "Harry Potter and How to Succeed in Business Without Really Trying star Daniel Radcliffe will kick off the event with a special appearance. Nominated for two Audience Choice Awards this year, Radcliffe previously won two trophies in 2009 for his Broadway debut in Equus in the categories of Favorite Actor in a Play and Favorite Breakthrough Performance."